This post is sponsored by Horizon Theatre; however, all thoughts and opinions expressed are my own. In this day and age it’s easy to feel like “Nobody Loves You”. In fact, just the other day on Twitter I asked “where exactly do people meet these days?” and people seemed perplexed. While dating seems to be getting harder, if you get a chance to go on one I want you to be ready. For me, I think a date should include the opportunity to talk and experience something together. It’s hilarious because there was a debate on Twitter last week about coupon dates, yay or nay. I say YES! Most coupon sites have ideas that many of us just wouldn’t consider, so why not? If you’re out single and ready to mingle, check out this great list of awesome date ideas in Atlanta. Zoo Atlanta: If you’re both a fan of animals and not off by strange animal scents, this is a great idea. A Zoo date gives you lots of time to talk and get to know each other. You can snack on different foods, get exercise and learn things as you go. If the date is heating up, make sure you take the train so you can steal a private kiss in the tunnels lol. Also, make sure you check the calendar for the events they have for adults, like Brew at the Zoo or Sippin’ Safari. Georgia Aquarium: If being indoors and marine life are more your speed, the Georgia Aquarium is also a great interactive date idea. I also recently found out that they do events call Sips Under The Sea, so be sure to check out their calendar! Ponce City Market: This really is like a hidden gem. They have shopping, restaurants/bars and even have Skyline Park where it’s 21+ Wednesday – Friday. Skyline park has rides, mini golf and much more. Stone Mountain: If you’re looking for an easy place to do a hike or just experience some great wildlife. There are lots of activities and options for grazing snacks/food. Check Out A Play: I recently checked out Nobody Loves You with a date and we both loved it! It was funny, insightful and very well put together. I’m a big fan of dating shows like The Bachelor and reality shows like Survivor so the idea of the play was really intriguing. I wasn’t really sure what to expect but I was pleasantly surprised and engaged the whole time. My date was cracking up through the whole thing so that’s definitely a plus. Nobody Loves You is a play that anyone can enjoy. It’s also a real treat because the Off-Broadway hit is being staged in Atlanta for the very first time, so you’ll one of the first to see it. The show runs through April 30 at Horizon Theatre in Inman Park. Tickets aren’t very expensive and the show is sure to spark up some great conversation, they even sold refreshments so this really makes for a well rounded date. Get Tickets Here! 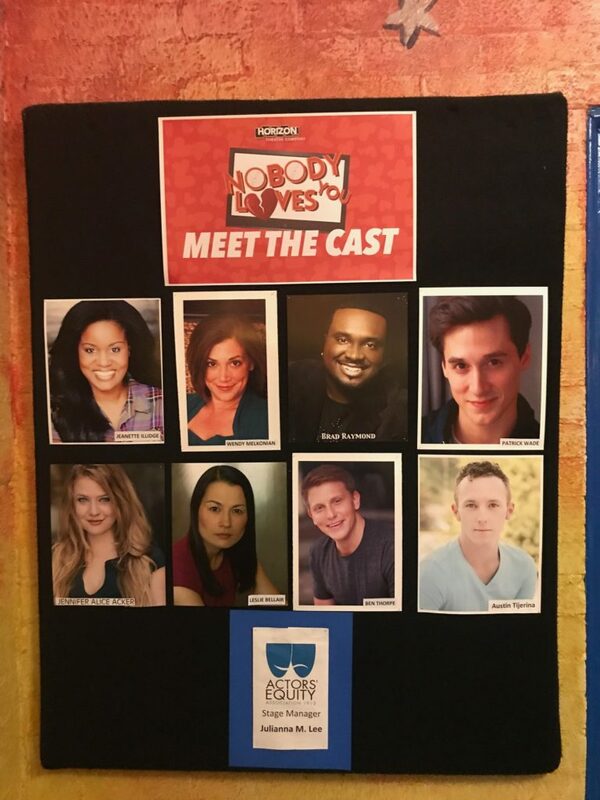 Nobody Loves You runs 1 hour and 45 minutes plus an intermission. Sophisticated and funky, casual and friendly, Horizon is Atlanta’s home for the best in contemporary theatre – smart, entertaining, fun and provocative. Outstanding plays from around the world, never before seen in Atlanta. Award-winning professional actors, directors and designers. Stories that are relevant to your life…provocative and fresh stories of positive change — all up close and personal in our intimate Inman Park/Little Five Points home. Annually they offer a mainstage season of 6-8 contemporary plays for diverse Atlanta audiences, a Family series for younger audiences, a free outdoor musical in Piedmont Park, and free outdoor performances with Little Five Arts Alive from April through October. Get Tickets Here!